In b4 Mane six all become immortal. Discord was the best part of the episodes. "Maybe it wasn't always the coldest part? 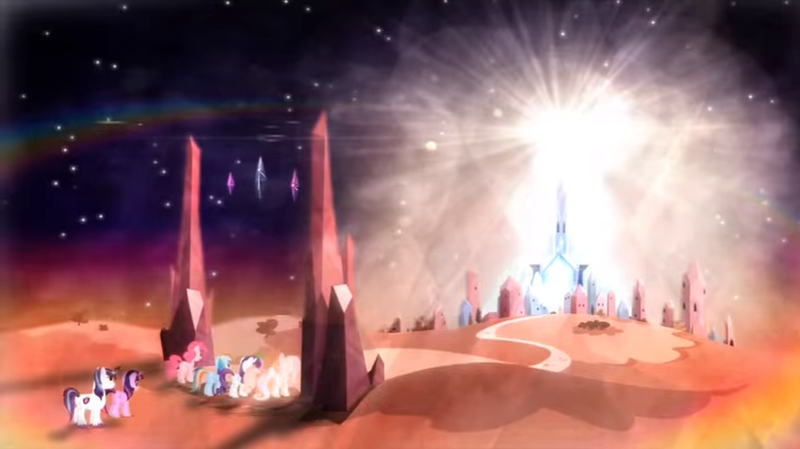 I don't know much about Crystal Empire history, I bet very few do outside the city itself. Maybe they were travelling by and something there made them stop and settle? I don't know why they would travel there in the first place but there are a lot of unknown variables," She mused mostly to herself. Everyone had different motivations for doing stuff that could be considered idiotic to others. "I live in Ponyville so I've had my fair share of crazy stuff happen around me. A little cold exposure in the city won't harm me too much. Of course, this is all assuming that the Heart is taken down while we're there. It seems pretty reliable so far." "Fiver huh? Where did they get that from?" A peculiar name it was. Five of what? Must be some sort of translation. "Is that a kind of translation?" she asked Fiver. She turned towards Golden Daze. "I don't know how special being from Appleloosa is supposed to be compared to Cloudsdale. I only spent like, a year or two there, I don't really remember before moving away. Outside of agriculture, there isn't really much else you can do there," She explained. "Oh it was really not that hard to tell. Maybe if I didn't know about the race, but luckily I've got my sources so I've got it all figured out." She just stared towards Golden Daze for a moment, it was clear the pegasus was actually affected by her weird statement. "They're just sides really." There was no indication of whether or not she was being serious or not in this instance. "Although maybe the right side might be better." "Hah, I would have thought you flying folk would enjoy being thrown up into the air the most. In the event that you don't, then maybe you can submit a very angry complaint?" She suggested. The train was kind of bumpy but it didn't phase her that much at that moment, if she really needed to she could focus on the ground and use her inner magic to keep her somewhat locked. "Yeah, most likely the old tracks. I don't think these tracks get as much maintenance as the other tracks. They probably just get enough to be up to standards. Let's just hope they are. I'm not particularly in the mood for anything going wrong." Oh speak of the devil. She heard the sounds of metal and it didn't sound particularly good to her. "Hey, um, I'm not sure if you guys hear it, but I think there's some sort of disturbance inside the train or something." "As far as I know, It's just a single city, doesn't feel like much of a kingdom either. Maybe a Principality?" she mused towards the calm pegasus. "That's the word right? I don't know much of the independence of the Crystal Empire after its return." Her education from her mother was both a blessing and a curse. She knew more than she wanted to and it meant that the stuff she didn't know kind of hurt sometimes. She could totally become a scholar, but that wouldn't be very fun now would it? "The frozen North can be cold, but the Crystal Empire itself is shielded from its effects. Unless you're flying outside of the boundaries, then you won't have to worry about freezing yourself," she explained to the totally overprepared pegasus. "Unless you mean on the way there, in which I trust the heating of this train to stop us from freezing." "Yeah sure, it kind of is good to meet new people, but If I got back home and my house was on fire, I'd be very worried." There was only so much relaxing one could do before stuff would start to go wrong. "I hear that some get their kicks from just riding trains, like the destination is just a bonus to their trip, it's all about the special trains that they put out sometimes. Never ridden one of those before, just the regular ol' trains." When the train started moving, she thought for a moment. What if a train ride didn't feel like one, would that be a good thing or a bad thing. Impressive in the fact that they made it feel like a house, but then it didn't feel like a train so... "I heard some engineers are trying to make a really smooth train. You could basically live inside it all the time and just travel around. It sounds like it would be very expensive to produce and maintain though." "My bad side is my every side, so, really there is no bad side. So make sure you get my good side, which is also my bad side." Hah, let them try and process that. She tried to look serious about her request, but she really didn't care. She just talked a lot to fill the void in the silence. "My name is Loose Cannon, formally of Appleloosa, now Ponyville," She mused at the thought of titles. It was weird, especially hearing one from a Griffon. Was it a title, or was it just context? "That might be what it says on my birth certificate." Knowing her, someone might actually miss the joke and actually believe her. She didn't want to explain anything. If it ends well then I won't entirely be. Whenever she read a book, she always wondered to herself if her image of the descriptions in the book were close enough to the actual depictions that were supposedly on the cover of the book. Of course, colour was a weird concept to her, but there were still attributes that seemed to surround them. Of course, she was sure that the cover art was not actually entirely done by the author herself and as such the description in the book was sure to be more authentic to the author's mental image. Some thoughts that occurred in her when she started reading her novel was whether or not that Griffon over there was truly staring at her or not. It happened often when she read, ponies and such not being accustomed to the method of braille. Or maybe they figured out that she was blind? That was something that was sometimes a hit or miss. A pegasus mare came in shortly after her and she did not recognise her any more than the rest. The fact that they left her mostly alone instead of trying to greet her immediately was a sign that she was not supposed to know them and it was not a so-called 'brainfart'. She had to suppose that the pegasus was here for the same reason that the other one was, except they did not seem as well, nervous. Her reading was a bit distracted as she paid attention to the pegasus put away her stuff, a sharp sound echoing around the cabin that could be heard by the others if they did not instinctively flush it out. The calm pegasus was the first one to break the relative silence by starting the conversation. So it would seem that it was everyone's first time going to the Crystal Empire, if she understood the calm pegasus correctly. From the reply of the eccentric pegasus, it was clear to her now that they were actually nervous. Nervous probably about that supposed race? What was that word she had heard before, 'Nervouscited?" Quite the portmanteau. "Sure is my first time," She replied taking her attention away from her book. She probably wouldn't need it right now anymore so she put it to the side. "If you asked me a month ago, I would have said it would be crazy for me to go, but I decided that I'd probably go eventually and that time might as well be now. I'm mostly interested in the culture, not the crystals. Although at this point is it right to call it an empire?" She was nearly startled by the sound of the door closing, but her quick internal response stopped her from showing much of one externally. Maybe she wasn't as early as she thought? Or maybe there wasn't anypony waiting so they just decided to leave. Wouldn't be good for any latecomers so she decided on the first option. Ah right, so that Griffon was drawing. And now she was asking if she could sketch them. She personally didn't mind, but it had no real benefit towards herself. "Uh yeah sure I guess, I mean, you know, if you really want to. I mean it wasn't like I could really catch you out for doing it," She replied. She knew the Griffon was just asking out of courtesy. "How long do you think this trip is going to take? I'm not trying to sound bored already, but I've only got one book with me and it's kind of supposed to last me both ways." Why the Crystal Empire? she thought to herself often over the past week. Besides it not really being an Empire, it was a city of crystals and gems, or at least they appeared to be, maybe they weren't really, she couldn't really tell. And as such begged the question as to why would she want to go to a place where she can't see the main attraction? Well, she had to remind herself that there was more to the destination than just its main attraction. The city was an ancient one, having been in stasis for essentially a thousand years, and that meant that a lot of its history occurred back then. Its culture could be considered a mix of ye olde times and modern Equestria. The most astonishing fact was that its mere existence is based on the power of all its citizens combined to protect the forces of the Frozen North, a force that as it seems, the ponies had not been able to fully tame for whatever reason that she doesn't know about. Maybe it's chaos magic, or maybe it's whatever magic is in the Everfree, is that chaos magic, or is it distinct? Thinking about magic hurt her mind. She was not supposed to think of such things. When Loose was planning her next potential journey for when she would be on leave, she had considered many different destinations, but one that she had overheard quite a lot was the Crystal Empire. She knew that she was going to get around to it eventually so she decided, why not now? Perhaps the most interesting part of the experience would be the train ride. The train went right through the desolate environment of the Frozen North so as far as she knew, the train was effectively the only way to get there and back safely. Except that didn't sound right at all, because who built that track? It was supposedly built before the stasis, but that just begs the bigger question of how is it still functioning? Ever since she started journeying big questions started to form into her mind, and they were too weird to think about. When she awoke that morning, her bags had already been packed from the night before. If her alarm was set correctly, then her internal clock which had developed over years of not really using physical clocks would be correct, she would make it over to the station and hopefully, would make it on board. No complications, she had done this a couple of times before and if she missed it, she could just give the booth manager a hard time. Nah she couldn't think that negative. She made it over to the station just in time to hear the conductor announce the train as hers. "Just made it," She whispered to herself. "Or maybe I'm early. Hmm." She smiled as she made it over to one of the cabins and trotted inside. Her ticket had been purchased the day before. If anything she totally could have left the day before, but she had missed the train, by a couple of hours. She bought the ticket early so she wouldn't have to deal with it now. I'll find a way to weasle Loose onto the train. She won't be going for crystals though. Totally not ditching her job. Totally not. Loose's perception is pretty weird so she might not notice right away. Nah, they actually hop onto a ghost train by accident and go onto the abandoned line which leads straight to hell. I really want to use Loose, but she has almost no reason for going to the Crystal Empire in the first place. I'm trying to develop Haste's app, but she's not really a WoE type of character anymore. Maybe I should finish Haste's App. If it's truly an adventure RP then I'll probably be able to stick through it more. I might be somewhat interested in this. I'm just worried about my own dedication. "Alright, so I'm definitely being a Paladin then," He said as he started to build the rest of his character. "I played the game a while ago, but like I said, that was a while ago. I haven't really read through the recent rules thoroughly, so as far as I know, I'm basically on par with everyone else." He probably sounded really modest, but it was kind of true. After some deliberation, SandBar decided that his Paladin would be a minotaur. He thought that the race best fit the role while not being a pony. A big tall stance to protect others, and with dextrous hands to hold equipment. Minotaur's weren't very fast creatures so there would be some penalties there, but it wouldn't be his key strengths anyway. Minotaur's were normally an isolationist species, so a Minotaur to be away from their group would be quite deviant. Maybe, their tribe doesn't exist anymore. That's probably why they became a Paladin in the first place. What about a name? The only minotaur name he really knew was from his teacher's recollections of one named 'Iron Will'. It didn't sound like his actual name, so he bet that their names were short and probably didn't need to make sense, kind of like Yaks. Why waste time on meanings? Maybe... Marcol. Yeah, he guessed that would work. While he was thinking of his character, two more creatures walked into the room. Silverstream and... no wait, that wasn't Ocellus. Unless it was, but wasn't Ocellus supposed to be doing something around now? No, it wasn't Ocellus. It was somecreature he had never met before, and he was uncertain of their species. It didn't really matter to him though. In her trademarked excitement, SilverStream marked this game as the best, although he knew for a fact that there was no way she could have played this game before. "Hey Silver, it really is a good game, if you can get a Good GM and can understand the rules good enough." So Smolder was playing a wizard as her character. Quite the contrast against herself, but he guessed that was kind of the point. If he put the same treatment on himself then he would probably be a dragon Barbarian or something, but it wasn't really something he felt like playing. He didn't want to force himself to not have fun. "Hey, you don't really have to worry about that Smolder. No one will be dying when I'm around." It would probably be him that died first, knowing his nature. "Alright, so my character is Marcol the Paladin Minotaur. He is the sole survivor from his tribe and rather than risk trying to join one of the other tribes at the thought that he could be seen as abandoning his original tribe, he decided to adventure out to try and help other creatures," he explained his character's simple backstory. "He doesn't get spells until level 2 so I haven't really thought of what I could use, although Lay on Hands is a pretty cool action. If Smolder is going to go support, then maybe I can focus more on Divine Smite, Although I kind of want to go defensive with Oath of the Ancient and Protection." He hadn't drawn his character yet, Minotaur's were differently shaped then ponies so he didn't really want to attempt it yet. Sandbar did a bit of Tabletop Roleplaying back in Seaward Shoals. An old stallion back there was into it and tried to drag him into it. He couldn't really get into it properly, it was a bit complicated even when they tried to dumb it down. However, that was back then and now he was certainly smarter and he was pretty sure that the newer versions were designed to be less complicated to get into. Of course, he couldn't remember much properly from the game, and he wasn't sure if the changes were drastic enough. He would probably be learning it completely again. He didn't need to give it much thought when deciding to join the game, it was clear how much Yona wanted to do it and he couldn't let her down. He couldn't let any of them down. Walking into the room, he saw that the place had basically been transformed. It wasn't meant to be a classroom anymore, it was more of like a blank slate. Perhaps to distract them from the educational mood and to put them more into the world of imagination. He would say it was a bit excessive, but he appreciated the amount of effort Yona put into this so he didn't say anything negative about it. "Hey guys, sorry if I'm late," he said before looking around. He was the fourth one there. On the other half of lateness but not the last one. "Guess I'm okay. Nice work on the place Yona. It was all you right?" He went over to the table and took a seat. "Those ribbons Yona, they're in theme right? Might give us a bit of a hint, although I'm not getting much of a complete idea yet." He pulled over a character sheet. He remembered his old character. A level four Paladin. That was all he made it up to before quitting back then. The GM was probably being nice back there with the Experience. Well, he kind of had to finish what he started, so his character here would also be a Paladin. He couldn't remember much else about the character. He didn't really care what his race was, so he would probably do that at the last second. "I still have to create- well, recreate my character from back then. None of you are Paladins right?" Not that he minded if any of the others were, he just wanted a bit of a diverse team. Roleplay Type: World of Equestria. Occupation: Student at the School of Friendship. Really, he doesn't need help with friendship, but it's an excuse to help others. History: Sandbar was born to a loving family in the small port of Seaward Shoals where he naturally gained a bit of an affinity in the ocean, most notably the marine biology. Although he really wanted to pursue his talent more deeply, he felt that at that point in his age, he couldn't quite do it alone. He needed friends, charisma, and in his small town, there weren't many others around his age. When he heard of the School of Friendship, he knew that was his ticket out of there, not that he hated the place, but because it didn't amount to him much at that time. He must admit though that he was going to miss his family, especially his foal sister. When he arrived at the school, he couldn't have entirely known what he was getting himself into. Five new friends from five different naturally less charismatic species, what kind of jackpot did he find here? He was just a pony like most of the others, why him? Well, his genericism would end up playing a key part in saving their school from Cozy Glow and the EEA. How could a pony willingly want to help some exotic weird creatures? Nothing could possibly go wrong if you just let him go. He's not like the others. A pony is just who he is on the outside. On the inside, he was a person, just like his friends. Character Personality: Sandbar is just a naturally nice and chill guy. He has a high desire to help others and will go along with plans that he doesn't necessarily agree with just so they won't go wrong, and if they do go wrong, well at least an attempt was made. He is not one to try and disappoint others, losing a friend might just as well crush him. The events at the School of Friendship has shown that he is an easily trusted individual. Character Summary: Sandbar is a dependable chill Earth Pony. He didn't become a student to help himself, but rather to help others... help himself. As much as he wanted to help the ocean, he felt the first step was to learn more about the world, and the best way to do that is to build up your charisma with some more friends. Even if he was debatably the most generic of the group, there was still a part for him to play in such group. "I am indeed. It's a psychology book. I'm not sure if I should bother boring you with all the details, but it focuses primarily on the Equus genus. Perhaps in a sort of sequel book I could delve into other species," Tranquility explained before turning to her sister. "Unless of course, you want to start writing it?" "No, I think I'll leave that up to you," Placidity replied. "I would suggest taking your entire herd along with you, but that begs the question of how big your herd is anyway. I'm guessing you're just going to wait until you're older when you have an heir to continue on your work." "A sensory spell could help visualise the magic aroma and it's directional flows. I say could, but really I don't see why it wouldn't work since it's still magic and thus shouldn't be that much different," Tranquility explained trying to remember her sensory spell. It was in there somewhere. "Anyway, I wouldn't worry too much about the whole salt thing, there clearly isn't anything wrong her that could possibly warrant bringing salt around to these parts." "All stories you say and no certain facts? Does no one here record any of your histories, anything that could certainly tell us what possibly happened?" Placidity would have exclaimed if she was a regular pony, but her artificial tone stayed the same. "I do have a theory that your current magic is somewhat overriding your flight capabilities. Your magic seems to resonate mostly with the environment and thus wouldn't atone much to the sky to give you flight as other creatures. Flighted creatures generally have massive proportionate wingspans alongside aerodynamic bodies or magic that interacts heavily with the air." "Enough talk I would say for this moment," Tranquility cut in fake coughing. "Would you help aid us in finding a place to stay for the coming week?"